If there's one thing Gordon Ramsay is good at -- you know, besides making scrambled eggs, chopping herbs, and swearing -- it's getting people to watch his TV shows. He's so good at it, in fact, that Fox is producing yet another reality program starring the meltdown-prone celebrity chef. This one will be called Gordon Ramsay’s 24 Hours To Hell & Back, and it sounds like a bonkers and even more intense version of Kitchen Nightmares. 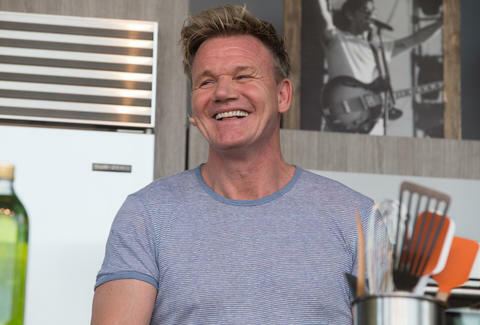 The series should sound familiar to any diehard Kitchen Nightmares fans: Ramsay will drop by restaurants on the brink of failure to help them right the course before they are forced to shut down, according to a report by Deadline Hollywood. The big difference in this case, however, is that he'll only have 24 hours in which to do so. In order to whip these problem-plagued establishments into shape on such a tight schedule, Ramsay will arrive with a 70-foot semi truck in tow, equipped with a top-notch mobile kitchen in which to help re-invent their menu, re-train their staff, and most likely fire people who can't handle the heat. Then, once the 24 hours are up, he'll help re-launch the restaurant. As you might imagine, adding a countdown clock to the mix is going to bring out some serious tension and, presumably, even more furious f-bomb-fueled tirades. As Ramsay himself said, per the report, "With the clock set at 24 hours-and-ticking, I can promise you this culinary boot camp gives a whole new meaning to ‘Hell on Wheels.'" There aren't any details about when the show will premiere, but as Fox expands its portfolio of Ramsay-helmed reality programming even further, expect to see plenty more profanity-laced promos hitting the airwaves sometime soon.